There's something about a Windsor style bench that says "Welcome home." 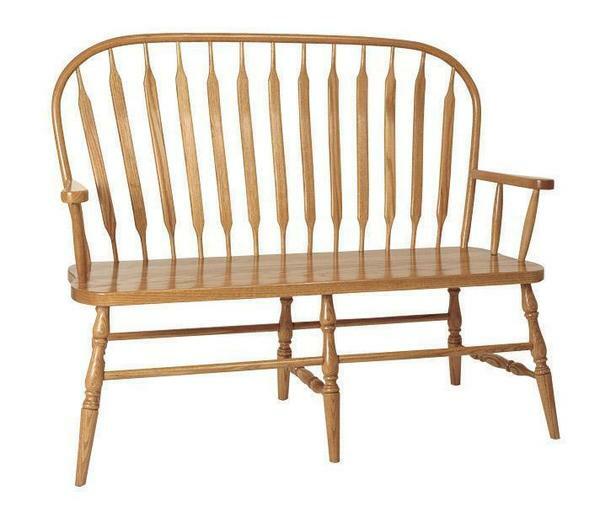 The Amish DE Bent Bench does this with grace as turned legs support the fanned out spindles. Each one is attached to a steam bent bow top. For a foyer or business entrance, this Windsor bench makes for a lovely attraction. Windsor furniture was built around a comfort concept and its appeal never wanes. This wood bench is from the Hillview Collection that creates beautiful Windsor, shaker and mission furniture by hand. If you'd like to make this bench a storage bench, no problem! The option is yours with our custom furniture. If you have any questions about our Windsor furniture styles or any of our Amish furniture, please email or call us today. Amish Furniture Specialists have the information you're looking for to create custom pieces. Thank you for shopping with DutchCrafters. Height from Floor to Top of Seat: 17 5/8"
Height from Floor to Top of Back: 40"